I purchased this brand because it specifically says on the bottle that it wouldn't harm my St. Augustine grass and that it WILL kill the clovers in the grass. It did just the opposite!!! The only thi g that died was my grass and now all you can see is the weeds. My yard looked better before I out this junk on it. Spectracide Weed Stop Ready to Use: Weed Killer or Fertilizer? Most everyone has issues with weeds, but weeds are particularly troublesome if you live in a warm, humid climate. Living near the Texas coast, I am fully aware of what the words "warm" and "humid" are all about and I have weed problems on a consistent basis. 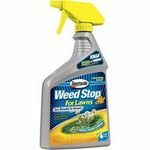 To handle my problem, I decided to purchase **Spectracide Weed Stop for Lawns Ready to Use Spray**, a product that claims to kill more than 250 weeds. **Weed Killer Commentary:** Spectracide Weed Stop for Lawns Ready to Use Spray is, like its name suggests, a weed killer that is pre- mixed and ready to use with a pull of the trigger sprayer. I have used other ready to use sprays like Roundup and Ortho and I have had good experiences each time. Just a few sprays to coat the weed is all it usually takes to kill them, root and all. But Spectracide Weed Stop for Lawns Ready to Use Spray is different. It has not delivered on *any* of its promises. 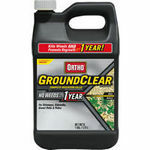 I first applied this product to some dandelions and other weeds growing in the open ridge in the middle of my driveway, followed by a few sprays on some weeds in my lawn. I waited and waited for something to happen, but after several days, there was no noticeable difference. The weeds I sprayed had not changed in any significant way. They were still as green and healthy as ever before. I even tried applying a second coat, but the weeds were still growing and thriving. 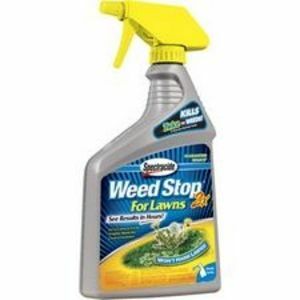 Frustrated, I peeled off the label on the bottle of Spectracide Weed Stop for Lawns Ready to Use Spray reveals a few facts about the product I did not know when I made the purchase and it helps to explain some of the ineffectiveness. 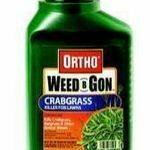 The first thing I checked was the listing of weeds that this product is capable of killing. It claims to kill 250 different weeds but, believe it or not, the common weed known as crabgrass wasn't on the list! Now, I understand that not all weed killers are capable of killing crabgrass, but the back label (the one you see before you peel the label open) of Spectracide Weed Stop for Lawns Ready to Use Spray clearly states: *Kills ALL major broadleaf weeds, including dandelion, chickweed, and clover*. Crabgrass is a type of broadleaf weed, yet the inside label does not list it as one of the weeds the product is capable of killing. Does Spectracide not consider crabgrass a *major* broadleaf weed? Is that their excuse? I consider crabgrass a very common (which to me, means the same as major) broadleaf weed. This seems like a clear case of deceptive advertising to me. Aside from the inability to kill crabgrass, I noticed another startling message on the inside label. It stated that Spectracide Weed Stop for Lawns Ready to Use Spray may not work and may require a second coating. That is fine, but it says to wait *three weeks* before assuming the weed needs another treatment and trying again. What kind of a weed- killing agent requires three weeks to work? A product like Roundup or Ortho spot weed killer produces noticeable results in one day. I don't have the patience to wait three weeks for a weed killing product to work- not when other products will complete the job in only a couple of days. And guess what? Even after waiting for three weeks, there was no noticeable effect on these weeds. **Bottom Line Viewpoint:** Based on my experience, Spectracide Weed Stop for Lawns Ready to Use Spray is a total failure. I did notice a little curling of the leaves on a weed or two. But that was it- the weeds were still not killed. They were still holding themselves together, growing as well as usual. This is very surprising, since I have generally had good results with Spectracide products. Looks like it's time to go back to Ortho and Roundup. Spectracide Weed Stop Ready to Use Spray has turned out to be more like fertilizer than weed killer and it ranks as one of the most useless lawn products I have ever tried.